It’s a beautiful day here in sunny San Diego, CA but I unfortunately lost a very dedicated and hard working member of the studio family. 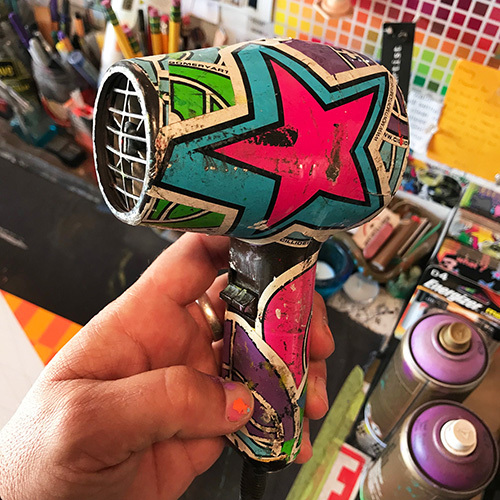 Keep the good ole’ hair dryer in your thoughts, she simply never let me down and was always there when I needed her to help me dry that paint! The ole’ gal passed away this afternoon at 1:40pm PST in the San Diego, CA studio. I knew she had been hurting a little lately so I had decided to give her a couple weeks off. Well, I fired her up this morning and she was humming right along and then suddenly, she threw out some heat and spit her final sparks. She was good to me over the years, almost ten to be exact. I’ll miss her dearly but she will be immortalized in the studio forever. Thank you so much for all your hard work, you’ll be missed hair dryer.